Emigrated from Northampton, England in 1638, immigrating to Salem, Massachusetts Bay Colony in the Americas. Parents of Captain George Corwin are not known and documented as of this writing. There is some non-conclusive evidence that his father is John Corwin, and that his grandfather is Matthias Corwin. Further research is needed before including his parents. The family of Cowin or Curwen as the name was spelled in earlier days came from England to Salem, Massachusetts about 1638 with other Puritan settlers of that period. George Corwin, better known as Captain George Corwin, was the first of the line in this country. [USA] He was a man of influence and high standing in the early fomation of the Massachusetts Bay Colony. Through his efforts the foundations of the merchantile and shipbuilding enterprises were established in Salem and its importance as a port thereby assured for many years afterward. He died in 1685 leaving "no debts and one of the largest estates to that date administered in Salem". Some of the elegant and costly articles owned by him are now in the historical museum in that city. The Captain's [Capt. 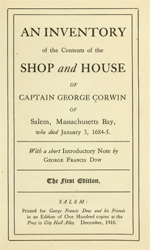 George Corwin] two sons were active in the public life of the [Massachusetts Bay] Colony. Both were sons by his first wife, Elizabeth Herbert a daughter of John Herbert, Mayor of Northampton, England. The younger son Jonathan became a Judge of the Supreme Court. John (1638-1683) married Margaret a daughter of John Winthrop Jr. Governor of the Colony of Connecticut and granddaughter of the first Governor of the Massachusetts Bay Colony, John Winthrop Sr. Captain Corwin also had four daughters named Abigail, Hannah, Penelope and Susanna Corwin. 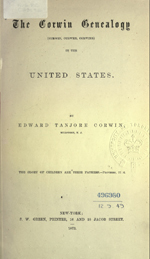 [S18811] The Corwin Genealogy of the United States, pg.xxix (Introduction). Edward Winslow, and many of their descendants.